Bags weren't pumped full of nitrogen, so the contents were easily broken. Hey, you spelled that just like Dan Quayle! 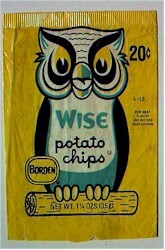 My dad used to work at Wise potatoe chips in Boston in the 50's. The "Boston Garden" was one of his customers.